"Made with super sturdy, weather-proof resin plastic, this doghouse can hold up against harsh weather conditions year-round." "Will give your large dog the space he needs to stretch out comfortably … so you can take your bed back." "Reviewers love this doghouse for its super simple assembly, spaciousness and affordability." "This extra small doghouse isn’t just ridiculously adorable...Made with solid white cedar, it’s naturally weather-proof, pest-resistant and durable, too." "If your dog prefers to sleep in a kennel when she’s indoors...check out this sweet, indoor doghouse from Petsfit." "Composed with “ecoFlex”—a composite of recycled polymers and poplar waste—making it more durable and weather-proof than wood and plastic." "Offers a garden box...a storage unit for food, toys or other supplies and a feeding area with included steel bowls; and its naturally insulated." Suncast’s DH350 doghouse is perfect for indoor or outdoor use, can accommodate dogs up to 100 pounds and won’t break the bank. Made with super sturdy, weather-proof resin plastic, this doghouse can hold up against harsh weather conditions year-round. Its composition makes clean-up easy — just hose it down with a garden hose whenever necessary — and its snap-together assembly makes set-up (or breaking down for cleaning) simple. Buyers love this doghouse for its ease of assembly, durability and affordability. Because this doghouse is made entirely of plastic, it lacks insulation; some reviewers recommend adding a rug, blanket or even straw to help keep it cozy. If you have a big dog (and have ever tried sharing a bed with him), you know just how much space he/she can take up. Measuring 45.6” x 30.9” x 32.1”, this pick from Petsfit will give your large dog the space he needs to stretch out comfortably … so you can take your bed back. Although it’s a bit pricier, this doghouse is elevated (so it won’t flood during heavy rain or kill the grass underneath it), is totally weather-proof and looks super cute, too — it’s like a sweet Cape Cod-style house for pets. Assembly is made simple with pre-drilled holes and the openable roof makes it easy to clean — or to give your dog her own skylight. This doghouse is manufactured with weather-proof wood, so it may not be the coziest option. Add the manufacturer’s recommended mat or put a few blankets inside for additional insulation. If you’re looking for a basic, no-frills doghouse at a great price, check out Suncast’s DH250 doghouse. Like our number one pick, this doghouse is produced with ultra-durable, washable and weather-proof plastic resin. Reviewers love this doghouse for its super simple assembly, spaciousness and affordability. Several customers even said their kids like to hang out in the doghouse with their pets! Suncast recommends this doghouse for dogs 70 pounds and under, so if you have a bigger dog, consider their DH350 model (our top pick, above). It’s not insulated, either, so if you’re going to use it outdoors, consider adding a mat or blankets to up its comfort and coziness. Arf frame—like A-frame, get it? This extra small doghouse isn’t just ridiculously adorable (and punny). Made with solid white cedar, it’s naturally weather-proof, pest-resistant and durable, too. The Arf Frame Dog House is designed as a “close fitting” habitat for dog breeds that prefer a smaller, tighter den. If your dog likes a little more lounging space, consider sizing up — it’s available from extra small to large. Because it has a smaller footprint (and an elevated bottom, so it won’t damage your carpeting), this doghouse can be used indoors, too. Heads up: Due to its composition, this doghouse may have a strong cedar smell, which some customers love and others hate. According to reviewers, however, the smell fades after a few days. This doghouse is on the smaller size, measuring 28” x 18” x 16”, so it’s perfect for dogs 20 pounds and under. Because it has a smaller footprint, it won’t take up too much floor space in your house, either. Petsfit offers a 30-day warranty, so if you’re unhappy with the product, simply contact them for a full refund. If your dog is often outside, choosing a shelter that will keep her warm (or cool) and dry is key. New Age’s EcoChoice Bunkhouse doghouse is composed with “ecoFlex” material — a composite of recycled polymers and poplar waste products — making it more durable and weather-proof than both wood and plastic. Plus, this doghouse is elevated to keep moisture, dirt and leaves out. It comes in multiple sizes, ranging from small to large, to accommodate any sized dog; the manufacturer recommends this doghouse for dogs 150 pounds and under. And although this doghouse comes in a natural tan finish with green borders, you can change up the color palette with paint or a stain. The best part? This doghouse comes with a whopping 10-year limited warranty — simply contact the manufacturer if you run into any issues. This cottage-style doghouse from Advantek is nicer than most of the apartments I’ve rented. Although this pick is the priciest on our list, it has some pretty great features. 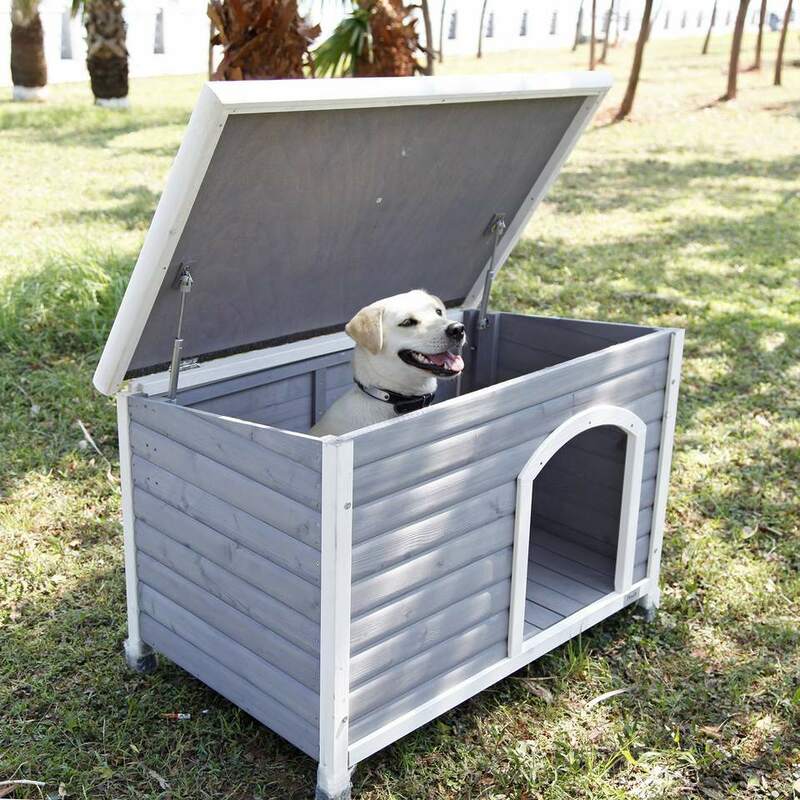 It’s manufactured with lumber grown in government-controlled, sustainable forests, so it’s eco-friendlier than most doghouses; it offers a garden box (so your dog can grow his herbs), a storage unit for food, toys or other supplies and a feeding area with included steel bowls; and its naturally insulated to keep your dog comfortable in any climate. Its wood panels are built using strong, but lightweight fir, which is naturally weather-proof and insect-resistant. It’s finished with non-toxic wood preservatives for additional durability. Plus, this doghouse has a non-toxic, waterproof asphalt roof that retains heat in the winter and cool air in the summer. Are you ready to move in yet?